It was a pleasant surprise last week at Liberty, when invited to the launch of RE, the much-loved lifestyle store from Northumberland, to find that it’s co-owned and directed by the husband of one of my ex PR colleagues from back in the day. RE first came to Liberty’s attention when the buyer was sourcing crockery for their exclusive dept store and stumbled upon designs (by a designer and supplier of Simon & Jenny). The buyer followed the trail back to RE and, from this, a pop up shop came about in the store last Summer that was a huge success, so much so, that when Liberty accrued some additional space in their 4th floor area, they offered part of this to RE as it fits so well with the brand, the ethos and the high taste level of the Liberty store. The 700 sq foot space offers raRE, REmarkable, REcycled, REscued and REstored homewares and accessories. The Liberty space, just off the East Atrium will be divided into key product categories with an ever-changing calendar of seasonal displays focusing on key events and past times such as; the Queen’s Diamond Jubilee, the British summer time, harvest festival and folklore, Halloween and of course a REcycled Christmas. The ‘eat’ area will house candy-hued American milk glass cake stands, printed plates, coloured glass and a new range of skull shot-glasses and tea light holders. The ‘cook’ section will focus on tea towels, vintage storage jars, scales and biscuit cutters. ‘Shrine’ is dedicated to Simon and Jenny’s love of ‘Day of the Dead’ motifs and Mexican trinkets, and a new ‘Last Supper’ print range of tea towels and plates. ‘Outdoor’ will feature rusty metal signs, restored garden furniture, vintage pots and tools. ‘Utility’ will cater for the cleaning obsessed and those with a love of hardware. 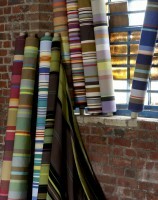 Vintage wool blankets and a new range of school blazer stripe cushions make up ‘living’. Old maps and vintage framed pin boards make ‘office’ the perfect place to pick up items to make working a little more bearable. Take a look at RE in Liberty or online HERE. You may be not be REsponsible for how much you want to buy. Previous post: New ‘Stars in Dior’ by Rizzoli and What Makes a Style Icon.